Venetian beads are amongst the finest available, and there is a long and rich history of making beads in Italy. The art of glass bead making is said to have started when Marco Polo returned from his travels with gemstone beads in a wide range of beautiful colors. The glass workers admired these gemstone beads and started to replicate the deep rich tones and colors in glass. These beads from Venice and Murano gained worldwide recognition and to this day are highly prized. What Are Venetian Seed Beads? Seed beads is the name given to tiny glass beads. In Italian these are known as conterie and these beads are available in a wide range of colors. Italian seed beads or conterie are made by the glass maker creating a long thin rod of hollow glass, sometimes several yards long. This rod is then cut into many tiny pieces, the hole running through the middle means that each one is a bead. Once the beads have been cut, they are fired until the glass just begins to soften and this gives the beads a smooth edge and removes any roughness. As each bead has been hand cut, they are often slightly different sizes and shapes. This differs from mass produced beads which are all uniform size and shape. Many people enjoy the fact that the beads are all slightly different because when these are turned into jewelry, every piece is unique. 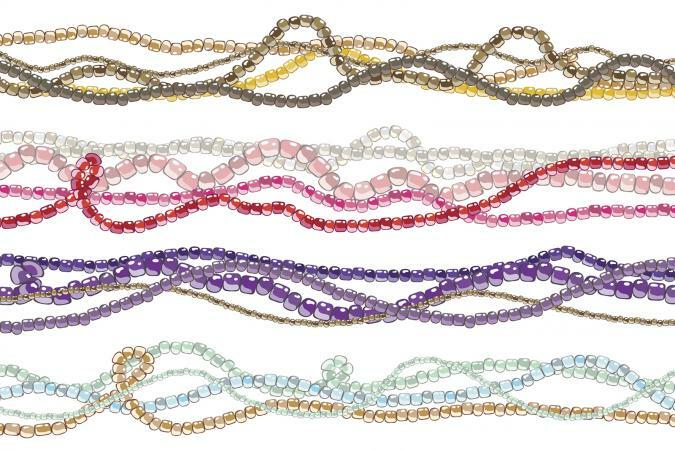 Venetian seed bead necklaces are available in a wide range of colors. This gives jewelers the opportunity to create jewelry using the beads as a paint pallet and to combine the beads to form new and different patterns. The tiny seed beads are often strung together into strands and the necklace formed of several of these strands twisted together. This gives an interesting texture to the necklace and the beads catch the light bringing a new depth to the jewelry. By carefully combining colors the jeweler will be able to create wonderful and unusual necklaces. Another type of necklace is made by the jeweler stitching and weaving the beads together, making a piece of jewelry from bead mosaic. A necklace can be complimented by other jewelry such as a bracelet. This is a wonderful style of jewelery and is highly unique. Jewelers specializing in this form of jewelry rarely make two pieces alike. Seed bead necklaces can be worn with many different outfits and are suitable for both formal and casual wear. Long seed bead necklaces can look absolutely stunning when worn with a dark dress as this will accentuate the colors. The same necklace can be worn wound around the neck a couple of time and a completely different effect will be achieved. Seed bead jewelry can also be worn with jeans and t-shirts, bringing a touch of class to a casual outfit. Seed bead necklaces can be bought from specialist retailers and from artisan jewelers who specialize in working with beads. In addition to buying from local jewelry stores or craft galleries, this jewelry can be bought online. This presents an ideal opportunity to shop around from the comfort of an armchair and take a look at what is available. VenetianGlassArt.com - Italian glass seed bead jewelery. VenetianBeads.com - Different Venetian glass bead items. If after browsing the many different jewelry stores the perfect necklace remains illusive, many bead jewelers will be happy to take commissions and to create a custom hand crafted seed bead necklace. Venetian glass seed bead necklaces will give years of pleasure if they are looked after correctly. The necklaces are made from hundreds of tiny glass beads should a strand break finding all the beads will be difficult. Therefore it is important to keep checking the necklace and ensuring that none of the strands are showing any signs of wear. If they are then a jeweler will be able to repair this. Glass beads also benefit from regular washing as this will remove any build up of dust or dirt and restore a bright gleam to the jewelry. This is simple to do, simply wash the necklace in warm soapy water or use a special cleaner, making sure it is well rinsed at the end. Leave somewhere warm for the necklace to dry. The retailer or jeweler will be able to give specific advice about how to look after a glass seed bead necklace. A glass seed bead necklace will be created from hundreds of tiny beads, each one hand strung. These make wonderful items of jewelry with each one being as unique as the wearer.